enough. 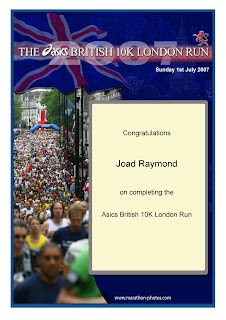 Recent races: on Sunday 1 July I ran the London 10k. At about 1k I passed Catherine Ndereba. Read that again, because I won't be able to write it again. The start of the British 10k is crazy. 20,000 people line up along the north side of Green park. On the other side of the road, separated from them by the entrance to an underpass, the elite line up before the actual start line (the usual inflatable arch). They do their strides and enjoy freedom of movement. The rest of us squeeze, though packed like sardines in a can, trying to get closer to the start. There's not much to do except wiggle, inhale a heady mix of traffic fumes and sweat, and watch the elite warm up. Catherine Ndereba looks very cool. I don't spot Baldini, but there's an awesome guy in a Morocan shirt. And two, twin models. I think they're meant to be celebrities. Just before the actual start, at 10 am, the crowds are released so they can walk over a bridge in an orderly fashion to stand behind the elite. In other words push like hell to save those extra seconds. A fat middle-aged lady in a a yellow t-shirt is overheard saying, "perhaps we shouldn't be so close to the front?" It's ugly out there, and uncharitable. The gun goes and the sub-elite trample the overweight, undertrained and genetically disadvantaged. It's a beautiful cool and sunny morning, though, and the course could not be nicer. And there's Ndereba fiddling with her shoe by the side of the road. There's not much point in having a nice warm-up area, and a 10 second advantage over the plebs, if you can't tie your shoelaces right from the first. Six k later we hit a switchback and I see her in front of me. She passed so silently and effortlessly that I didn't even see her. She ran 33:11, coming in second woman. The kilometre markers disappeared about half way through, and I realised while plodding along about a kilometre from the end that it was almost over. I charged what was left. I was greatly assisted by a woman wearing a Cambridge University Hare and Hounds who materialised thirty metres ahead of me in the final straight. The photographs show me bounding past her. Far too much vertical movement. I spoke to Emily afterwards: it turned out she'd just finished an advanced degree at Oxford, and was no longer associated with CU. So I needn't have bothered. I took ten seconds off my PB -- it would have been more had I paid more attention in kilometres 6-9 -- coming in at 38:24. However, the official time was, irritatingly, 38:34. That's watch and pencil timing for you. I was 69th. Stefano Baldini won in 29:27. The following thursday the eastern clubs 5k league (the Kevin Henry league) race was held in Cambridge. I brought my PB down to 18:20 and felt pretty good. Sub 18:00 may be in sight. More pressingly, I've signed up for the Berlin Marathon on 30 September. It was Sean's idea. It means doing my long runs in the blistering heat of Virginia over the summer. Watch this space.